Space or Left Mouse Button - Drops a bomb. 'P' - pause the game. Esc - return to start screen. Mutant fast growing flora (trees) have invaded the airport. Your aeroplane is running out of fuel and must land. Bomb the trees & clear the airport runway. The Mutant trees have an anti-gravity property which means Parts of them can float. Your bombs downdraft will pull any floating parts down within its blast area. Hit tree parts which are underneath floating areas to pull them down. App Game Kit 2. This was an easy decision for me AGK2 has been a favourite of mine since its release and it allows quick and easy, yet powerful game development. At the moment I have chosen shooter as the main (and only) thing you do in this game is shoot bombs. To embrace the theme this game mainly features the growth of mutant trees over your runway and the trees get bigger as you progress. The theme is also incorporated in other ways. Your aeroplane grows faster. A tree Grows on the menu screen and a `growth wheel of fortune` to randomly make things more difficult, (e.g. plane that grows faster. Growing taller trees, Growing more leaves etc.). I hope to make some more references to the theme as the game grows into fruition. Due to the time restraints of this competition I decided to rely heavily on ready made graphics and sounds. I had bought the humble game making bundle and already had resources from many sources. The main ones I have used are from the Indi Graphics Bundle, Sound Matter and JDB Artist - Inspirational Vol.2. 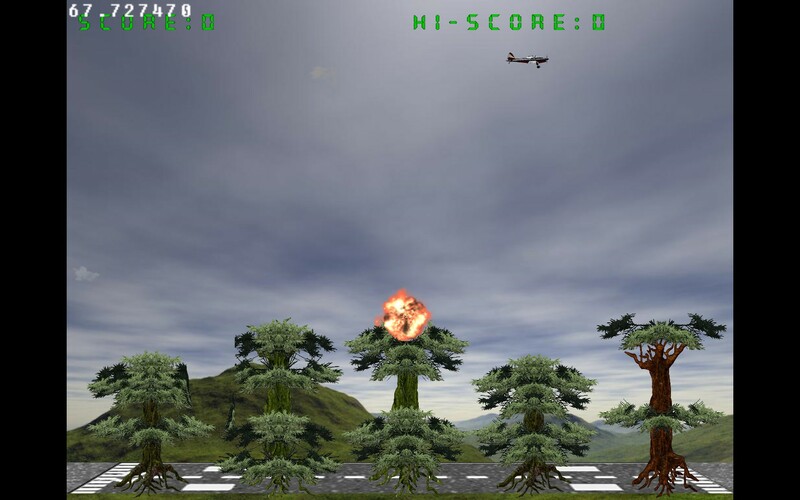 The Gameplay in Mutant Flora Bomber will be instantly recognisable to anyone of "a certain age". Your Aeroplane has run out of fuel and you have to clear your runway by bombing the obstruction. This is actually the premise of one of the first games I ever programmed and was very popular in the early 1980s. In Mutant Flora Bomber, mutant trees are growing on your runway. I chose trees rather than the traditional city to help embrace the theme, also I think bombing cities has became politically incorrect lately. I have entered a few competitions over the years and always try and keep things simple. The time I can devote to my programming hobby is very limited and this is the only way I can create a finished entry. The game can become quite frantic and I hope fun to play. The inclusion of both local and global high score tables should encourage a competitive edge. I Dont plan on having any. On the first day of the contest I decided on the game type of Bomber. I had had an Idea for a Worms Like game and wanted to try destructible landscapes. However I did not think I would have time to make a good Worms type game and decided to keep thinks simple and make a great bomber style game. I made good early progress and you can see an early concept screenshot above (The one with the buildings). Once I was happy the concept was achievable I quickly progressed from traditional buildings to trees. Over the last two weeks I have continued to be quite productive and have refined the gameplay added collision made a start screen with options, added sound, Made this Blog. All options are now operational. I have continued to refine game play and have introduced a growth wheel of fortune to randomly make things more difficult, e.g. plane that grows faster. Growing taller trees, Growing more leaves etc.. 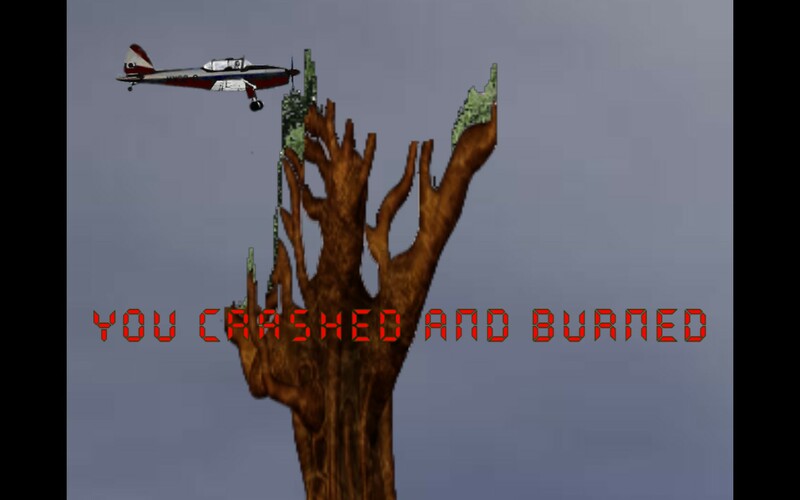 I have made a death scene which zooms into your plane allowing you to see why you crashed. Getting the difficulty level and speed at which the game progresses has been challenging however I think I am getting there. I have removed the In line screenshots from the blog as they did not display properly. Still to make global online and local High Score Systems. add polish, tidy the code and make a stand alone exe for submission. Thanks for the comments and encouragement and I will try and find the time to post a video this week. Are any of you submitting entries ? 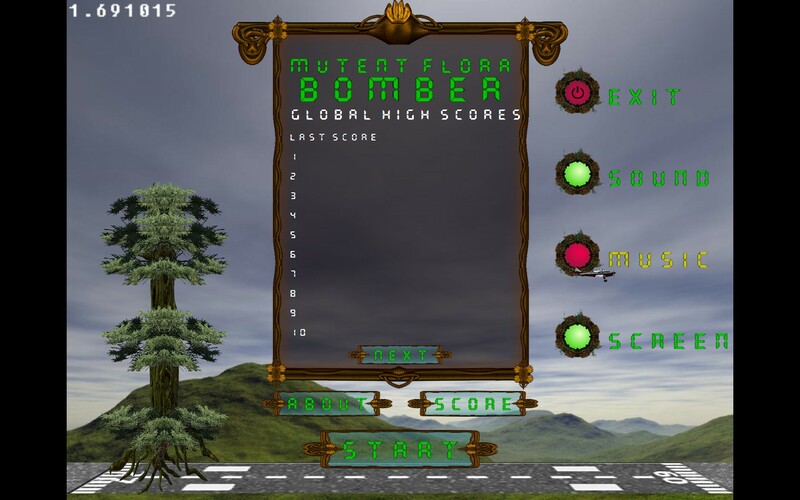 Finished the high score tables (local and Global) and it is More or less a finished game now. Still to add polish, tidy the code and make a standalone exe over the next few days. Might add some flower power ups and downs. Have added a gameplay video to the media here at the top of this page. Tweaked more elements of the game play. Re-arranged the start screen. Cleaned up the game folder and have made Mutant Flora Bomber V1.0 as a stand alone exe, made a Growth.txt and zipped them together. The Zip has been added to my Google drive and is now available for download. I still have more improvements I would like to make, however I felt it was time to get something submitted, just to be safe.. Please download, try it and assure me that everything is working ok, as I still have a couple of days to fix things. I have now uploaded what I expect to be my final entry. I have added Fauna, which, if hit causes you to lose points. I had toyed with the idea of flower power-ups but decided it would not make the game better and only clutter the nice play area. I am very happy with the way the game turned out and will only change this upload if I find any bugs in the next few hours. Thanks to Velkro for play testing. Thanks to Game Dev Fort for a great competition. Thanks to The Game Creators for their amazing development tools. Thanks to the Artists who (for a small fee) allow the use of their amazing work. 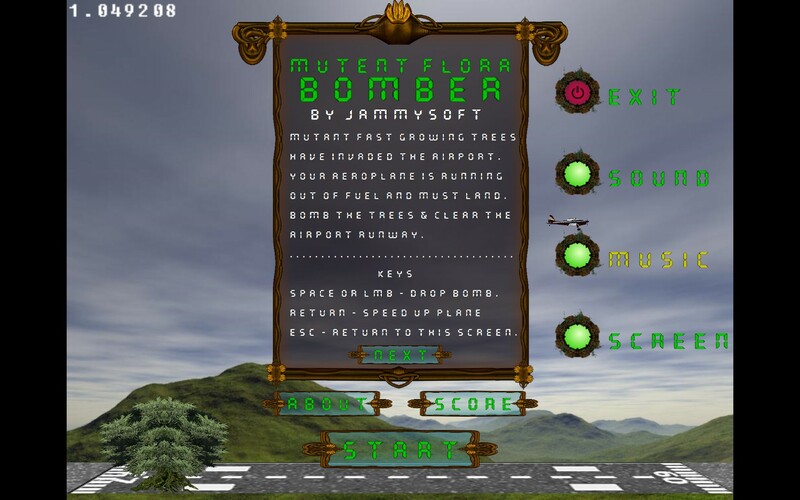 I have had a lot of fun and learned much making Mutant Flora Bomber and I hope you will like playing it. The rules of this competition do not allow the submission to be changed after the deadline, However I may make an Android version and put it on Google play (With AGK it is very easy). 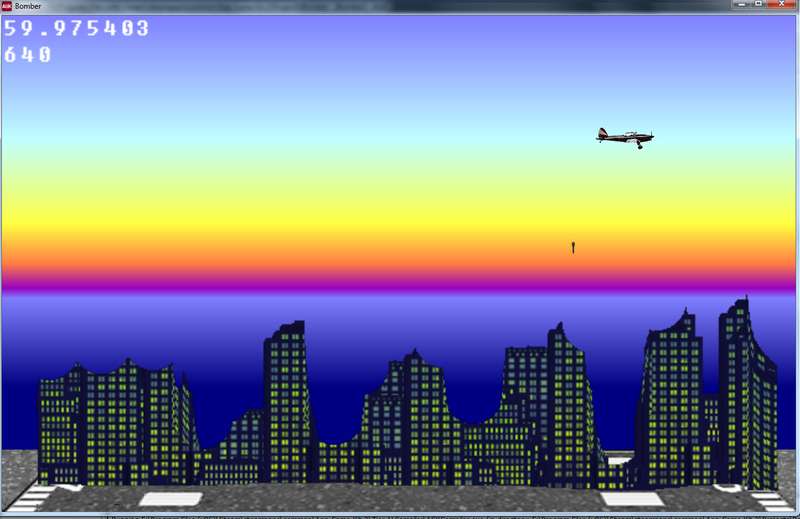 I think i will also use what i have learned with destructible landscapes and make a worms or Tanx type game. Download and give them a try. Please rate and leave feedback. Click an advert ot two to support future development, thanks. Unable to get the game functioning on multiple devices, operating systems, and platforms. I have had no other reports of the game not working and have had freinds playtest it on their PCs without problems. I also just downloaded it again and it ran fine. I was looking forward to some proper feedback, but there you go. I did not think Mutant Flora Bomber would win, but Im sure it is easy enough to run. No Idea what the problem has been. If you have problems getting it to run please leave a comment.